How Does the Service Members’ Civil Relief Act Impact Family Law Matters in Florida? The Service Members’ Civil Relief Act (SCRA) is a federal law that provides active duty military personnel with the ability to postpone various court proceedings. SCRA is covered in detail at 50 U.S.C. App 501-597b, and because it’s a federal law, states like Florida are bound by its provisions. The SCRA provides these special benefits to military personnel who are unable to attend a court proceeding because they are deployed or on active duty. The SCRA also extends benefits to reservists who are called to active duty and Coast Guard and National Guard members in some cases. The idea behind the SCRA was to help military members avoid any distractions while undergoing operations or on deployment. It’s important to note that the SCRA doesn’t make legal proceedings disappear or get dismissed, it is only a way to postpone the action until the military member is no longer on active duty and can appear on his or her own behalf. The SCRA doesn’t stay the action for the entire deployment or for however long the person is in the military. Instead, it allows for a minimum of 90 days if needed. You can apply for another stay if there is good cause for it and the first stay is about to expire. Although the SCRA is a federal law, some states have passed their own version that goes above and beyond the original SCRA. Florida has enacted its own statute, 250.5201(3),which expands SCRA protections to governor-ordered National Guard calls to duty, provided the call exceeds 17 days. In these situations, the judge in a civil action can postpone the proceedings for 30 days on their own, and must issue a stay if either party files a motion requesting a stay. The only time a judge may not grant the motion is when the court finds the active duty status of the military member doesn’t materially affect his or her ability to prosecute or defend the action. Florida also offers its own Affidavit of Military Service, Approved Family Law Form 12.912(b). Can a Default Judgment Be Entered? Under normal circumstances, if the defendant is a no-show in a civil case, the court has discretion to order the entrance of a default judgment. With the SCRA, if the defendant is a known military member, the court is prohibited from entering a default judgment. The plaintiff must file the Florida Affidavit of Military Service that denotes the defendant is not in the military service, or that the plaintiff doesn’t know whether the person is in the military or not. The SCRA allows for family law matters like child support and divorce proceedings to be postponed. 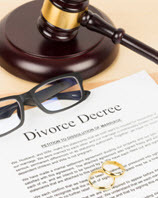 This can be to the benefit of the military member if the divorce is contested and he or she does not want to get divorced in the first place. For the civilian spouse, it can be frustrating if they have to wait longer for the divorce to be finalized or get a ruling on child custody and/or support. Family law matters can be complex on their own, but they are more challenging when one or both parties are in the military. If you’re in the middle of a contested divorce or contemplating filing an action for divorce against an active military member, you need a skilled Florida family law attorney. The attorneys at Schwartz | White have years of experience with difficult family law matters. Contact our office today to schedule a consultation and let one of our attorneys help you through this emotionally difficult time.